Knesset Speaker Yuli Edelstein says Jewish heart is in Judea and Samaria, hopes to be able to declare sovereignty from Knesset. An event was held in the Knesset this afternoon (Tuesday) attended by hundreds of guests to mark the anniversary of the Six-Day War and the renewal of settlements in Judea, Samaria, and the Jordan Valley. Knesset Speaker Yuli Edelstein said at the event: "For two-thousand years the Jewish people have been in an artificial situation - because their hearts - the hills of Jerusalem, Judea, and Samaria - were far away from them. Today, 50 years after the Six Day War, we have returned to breathe the clear mountain air. Jerusalem is reunited and the homeland is liberated - and we are bringing the land back to life. Ladies and gentlemen, our hearts overflow when we see the development of the settlements and their fruit. But these are not the reasons that we insist on settling in Jerusalem, Judea, and Samaria despite all of the difficulties. We are living in Judea and Samaria, because that is where our hearts and the source of our lives is. We are building in Judea and Samaria, and we are living in Judea and Samaria. Where the historical infrastructure of our national existence rests, if not Beit El and Kfar Saba, Nablus and Haifa, Hebron and Tel Aviv - the national pulse of all of us will weaken, and our dwelling the Land of Israel will be undermined." Edelstein added: "From here, I want to appeal to the settlers, who are now going through a difficult period, and we do not hear much about it in the media, but the wave of stone terror has recently increased, endangering human life, day after day. 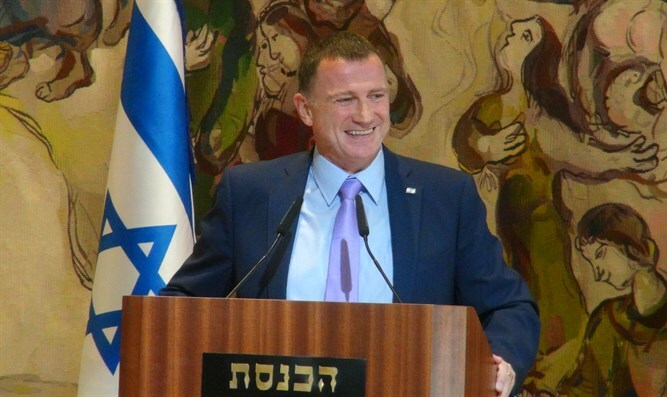 "I hope that soon the Knesset will come out and issue the sale de jure, and not just de facto, in our eternal connection to Judea and Samaria, and it will be a great privilege for me as Speaker of the Knesset to proclaim this news," Edelstein said. The event was also addressed by Yesha Council Chairman Avi Roeh and other leaders of the settlements in Judea, Samaria, the Jordan Valley and the Gaza Strip.